Slapsticks Comedy Club at The Crowne! "Slapsticks Comedy Club At The Crowne" is an intimate comedy club setting located in the newly added Allegheny Room, complete with full bar service, dinner and appetizer options and talented comedians from throughout the country. 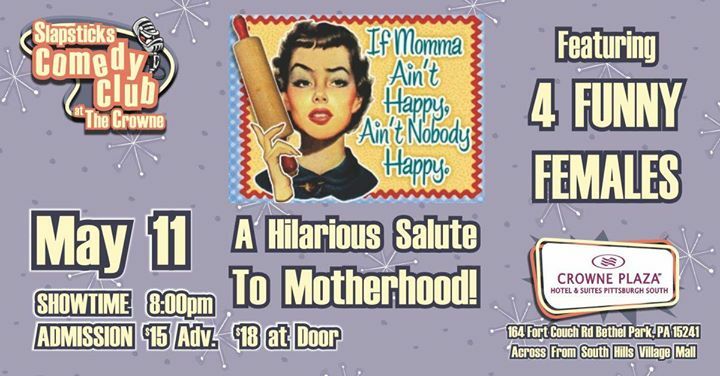 A HILARIOUS SALUTE TO MOTHERHOOD! Let Us Extoll the Virtues of Our Dear Mother... With Hilarity! Comedians seen on HBO, Showtime, Comedy Central and A&E are the norm at Slapsticks Comedy Club!